What are half-day, full-day, and home based services? In half-day programs, you drop of your child off every weekday for either a morning session or afternoon session. In full-day programs, you drop your child off every weekday from around 8am to 3pm. (Each center has its own hours, contact the center for more information.) To be in a full-day program, you must be in school or working at a job. In home-based programs, a well-trained teacher visits your home once per week to lead learning activities. What is a Child Care Partnership? A Child Care Partnership is when a Detroit Head Start agency works with a child care center in their neighborhood to provide Early Head Start programs. These classrooms have the same requirements for teachers, curriculum and safety. They also have longer hours since the classrooms are located within a child care center! Do I have to volunteer in order to be a part of Head Start? What will my child learn in Head Start? We believe that children learn best through experiences. Children in Head Start have direct hands-on experiences with language, communication, math, creative arts, science, technology, and social studies. Head Startteachers help children explore many different types of play and learning inside a safe and clean classroom. We use the High Scope curriculum. Watch a video about the infant and toddler curriculum. Watch a video about the preschool curriculum for children 3-5. Yes! We encourage you to apply if your child has a disability or developmental, social, or emotional delays. We make extra effort to ensure that specials needs are met and that children with disabilities integrate into the classroom smoothly. To learn more about how Head Start supports children with special needs click here. If none of the above items apply to you, you can also qualify if you earn a low income.Detroit Head Start providers can help you find out if you meet these income requirements. You can complete a pre-application form here or contact a Head Start agency directly. Be prepared to tell the agency how much money everybody in your household earns every month. You can enroll in Head Start at any time during the year. It is best to apply during the summer, because you have the best chance of getting into the program then. How long does it take to enroll and get started? Once you complete a pre-application form, agencies with openings for your child’s age will contact you. The agencies will determine your eligibility. They may make an appointment to complete the necessary paperwork with you. This appointment could take an hour, and you may bring children. What are my options if I’m on a waitlist of a center-based seat for my child? Early Head Start and Head Start agencies operate under year-round enrollment. Whenever a spot opens up, they will contact waitlist parents to fill seats. There are some other options for you to consider while you wait for a spot. If your child is under age 3, ask about the home-based program. In this program, a well-trained teacher will provide one-on-one support to your little one and you each week. There are also classes for families where they can come to socialize with other families and kids. Read Renee’s story to find out more about home-based programs. If your child is under age 3, inquire about Child Care Partnership options. Read Ameera’s story to find out more about Early Head Start programs in this setting. If you have a 4-year-old, explore options with Great Start Readiness Program (GSRP), a state-funded preschool to prepare children for kindergarten. To find out if you qualify and locations near you, contact Wayne RESA at 734-334-1479. Yes! We encourage you to apply if your child has adisabilityor developmental, social and/or emotional delays. Detroit Head Start agencies welcome children of all abilities. We make an extra effort to ensure that special needs are met and that children with special needs are fully included into the classroom smoothly. To learn more about how Head Start supports children with special needs click link below. What if my child has an Individualized Family Service Plan (IFSP) from Early On? What if my child already has an Individualized Education Plan (IEP)? Sharing valuable information about your child’s needs begins during the enrollment process. The sooner we have this information, the more quickly we can work with you to address your child’s needs and ensure services are delivered per the plan. What can I do as parent to help my child’s special needs? As your child’s first and best teacher, your insights about your child’s behavior and development at school and at home are vital to determining how to support their optimal learning and development. Additionally, a parent or guardian’s permission is required to evaluate your child’s needs and to provide services and support. It is extremely important that a parent or guardian is involved at every step. 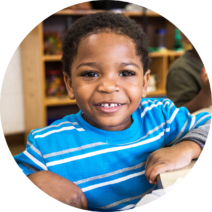 The Head Start agencies with Detroit Public Schools Community District’s Office of Specialized Student Services are required to share their concerns and recommendations to support your child’s optimal development. Ultimately, the parent or guardian must agree to the final plan for programming and/or services. How does Head Start help children with special needs? Parents or guardians and staff work together to better understand the concerns about a child’s communication, adaptive, cognitive, physical and/or social-emotional development. This team will determine if there are adjustments to your child’s learning plan that might be helpful, or if your child is eligible for special needs programming and/or services based on the Michigan Administrative Rules for Special Education (MARSE) and a federal law called the Individuals with Disabilities Education Act (IDEA). My child is so young. Could he/she just grow out of it? Why is early intervention important? Early intervention is always best. Young children vary in their skills, knowledge, backgrounds and abilities. The more support we can provide a child during this critical time of development, the better the long-term outcomes for school and life. An August 2016 study by Michigan State University found that “young children with multiple disabilities who are enrolled in Head Start have better literacy, reading and math scores than children who aren’t” in the program. What is the RCT meeting? The Resource Coordinating Team (RCT) meeting is an early step in considering additional supports your child may need. The RCT meeting brings together you, your child’s teacher, members of your child’s Head Start educational team and members of the Detroit Public Schools Community District’s Office of Specialized Student Services to discuss issues that may be affecting your child’s learning. A parent or guardian’s attendance is necessary at this meeting. You are a critical member of your child’s Resource Coordinating Team. As your child’s first and best teacher, your insights about your child’s behavior and needs at school and at home are vital to this conversation. This meeting cannot take place without you. Additionally, the team must have a parent or guardian’s permission to move the evaluation forward. Be aware that a copy of a birth certificate or birth verification will be needed for Detroit Public Schools Community District to initiate services. The outcome of the RCT process is to determine the appropriate next steps for your child’s optimal learning and development. What is an IFSP? What is an IEP? The primary differences between an Individualized Family Service Plan (IFSP) and an Individualized Education Plan (IEP) is the age of the child receiving services, the location of services and the delivery of service. An IFSP provides early intervention services to children and their families from birth to age 3 with special needs, services are provided in the home and/or school setting, and the child’s parent/guardian is typically an active participant during the provision of services. An IEP provides services and/or programs to children with exceptionalities ages 3 to 26, the location of services and/or programs is within the school setting, and the parent/guardian is not a direct participant during service or program delivery.This handout from the Office of Head Start is a great visual. How does Head Start protect my child’s privacy regarding special needs? Every child’s needs are different, from in-class accommodations to one-on-one services. Head Start agencies strive to include children with special needs in all regular classroom activities, alongside their peers. If children leave the classroom for necessary therapeutic services, this is done in the least disruptive way to their scheduled day. Thefederal Family Education Rights and Privacy Act (FERPA) law protects the privacy of student education records and sharing of student information.